Prominent & Leading Manufacturer from New Delhi, we offer green heavy blender bottles, blue heavy blender bottles, heavy blender broadcast bottles, black prostak blender bottle, blended soot blue shaker bottles and blender shaker bottles. With huge industry experience, we are involved in offering a comprehensive assortment of Green Heavy Blender Bottles. 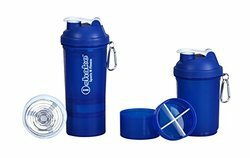 Owing to the presence of our skilled professionals, we are engaged in offering a wide assortment of Blue Heavy Blender Bottles. We are passionately engaged in providing a wide assortment of Heavy Blender Broadcast Bottles to our valuable clients. Widely acclaimed as an efficient and effective manufacturer, supplier and wholesaler, we are engaged in offering Black Prostak Blender Bottle. 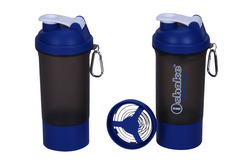 Widely acclaimed as an efficient and effective manufacturer, supplier and wholesaler, we are engaged in offering Blended Soot Blue Shaker Bottles. We are a leading manufacturer, supplier and wholesaler of Blender Shaker Bottles. We offer a wide range of Heavy Blender Bottles. We obligated to meet the quality standards as per the customer demand. Features Gyming, running, yoga, kitchen, work. Scientifically designed ball for lump free smooth shake. “Stay Fit is not a destination, it is a way of life”. 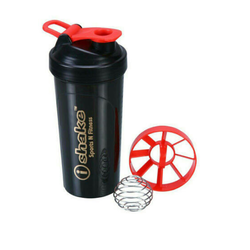 Keeping your fitness goals in mind, iShake presents its 019 Blender Shaker Bottle – 500 ml. 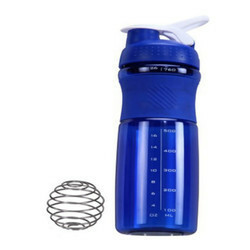 It is made from high quality food grade, non-toxic and 100% BPA Free for health safety. It’s easy to fill and easy to clean, giving you long years of use. It contains two storage boxes, one for your protein supplements and the other (four-sectioned) storage box for your pills or capsules. It has got a scientifically designed Steel Whisk Blender for instant and smooth mixing and eliminating powdered lumps. 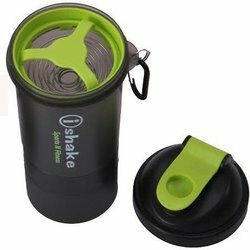 It is beautifully designed for easy drinking and pouring. It comes with a key chain for easy carry. 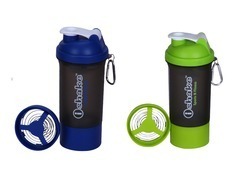 It is available in variant color combinations of body, cap, lid and blender. 1. Steel Whisk Blender and Storage Boxes: Experience the scientifically designed Steel Whisk Blender for instant and smooth mixing which helps you eliminating powdered lumps completely. 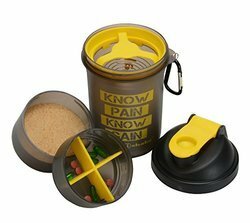 Now you can carry your protein supplements, pills, capsules etc. along with two detachable storage boxes, the second one with four compartments. This attribute will not only help you carry your pre and post workout supplements along but also help keep them dry at the same time. 3. Easy Clean, Easy Use and Easy Carry: It is easy to fill and easy to clean, giving you long years of use. Our advanced design let you open the lid easily. 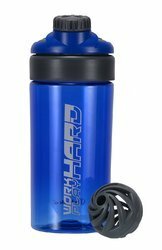 You can open and drink with one hand and stay hydrated while performing other actions. Its little key chain helps in easy carry, carry even with a finger. 5. 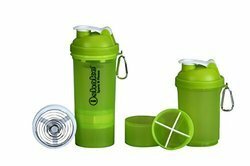 Attractive appearance: You will fall in love with its modernized design which is available in variant and beautiful combinations of colors of body, cap, lid and blender. “Stay Fit is not a destination, it is a way of life”. 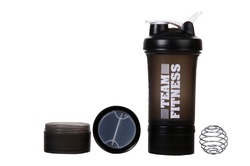 Keeping your fitness goals in mind, iShake presents its 019 Blender Shaker Bottle – 500 ml. 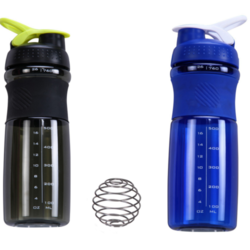 It is made from high quality food grade, non-toxic and 100% BPA Free for health safety. It’s easy to fill and easy to clean, giving you long years of use. It contains two storage boxes, one for your protein supplements and the other (four-sectioned) storage box for your pills or capsules. It has got a scientifically designed Steel Whisk Blender for instant and smooth mixing and eliminating powdered lumps. 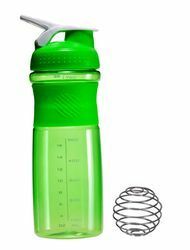 It is beautifully designed for easy drinking and pouring. 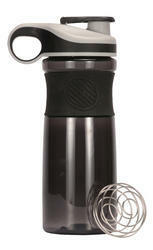 It comes with a key chain for easy carry It is available in variant color combinations of body, cap, lid and strainer.